Tag line: " If you believe in the light, you've got to believe in the dark"
Angry over the death of his mother (who was killed by religious fanatics because she dabbled in witchcraft), Sean (Shiloh Fernandez) shoots himself in the head, which, unbeknownst to everyone, releases a curse on the small community of Grovetown, one that causes otherwise normal people to do exactly what Sean did: commit suicide. As the death toll rises, Dylan (Kelly Blatz), the son of the town’s most respected preacher, confronts Aidan (Thomas Dekker), Sean’s brother, and demands that he answer for what his family has unleashed. While most of the town is against him, Aidan is befriended by Lindsey (Elizabeth Rice), who objects to the way her boyfriend (Dylan) is acting. But when it looks as if Lindsey herself will be the curse’s next victim, Aidan makes a startling confession, then promises to do everything he can to protect her. 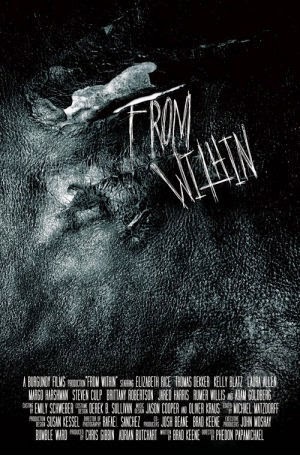 For me, one of the most fascinating aspects of From Within is its premise. Launched by black magic, the curse (which spreads one person at a time) invades the psyche of its potential victim, convincing him or her that their doppelganger is out to get them. In an early scene, young Molly (Amanda Babin) comes face-to-face with an entity that's a mirror image of herself (confused and frightened, she attempts to run, but to no avail). The look of these “duplicates” is also one of the film’s strong points (they’re exact replicas in every way except the eyes, which are lifeless), and some of the scenes where they’re facing off against their human counterparts are exceptionally tense (being supernatural in nature, these entities aren’t bound by physical laws, and can appear anywhere, at any given time). Unfortunately, the payoff of each encounter is far less satisfying than what precedes it. Take, for example, the sequence I mentioned above, where young Molly is on the run from her doppelganger. After a nerve-racking chase, the duplicate corners Molly and cuts her wrists by running them along the broken glass of a windowpane. Yes, it’s a violent end, but it’s also not a very creative one. In fact, none of the deaths that result from the curse are anywhere near as interesting as the encounters themselves, taking the edge off each one at the precise moment they should have been at their strongest. I also didn’t much care for the movie's religious angle, where stereotypical Christian zealots spew hate and sanction violence, all in the name of God. Characters such as these have become a tired cliché, and in my opinion From Within would have been just as good without them. The above weaknesses aside, From Within is a decent, well-made horror film with thrills, chills, and a surprise or two to keep you on your toes.